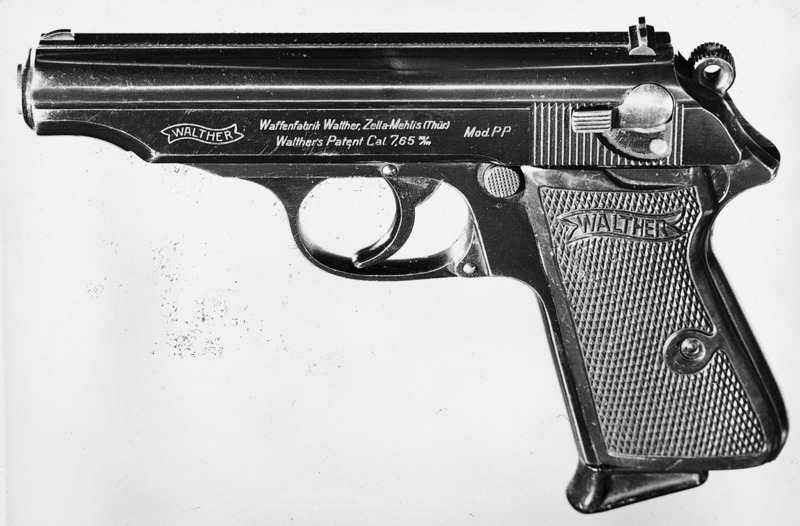 A semi-automatic pistol that was first delivered in 1929, the Walther Model PP had been designed for police use as indicated by its full designation, Polizei Pistole (police pistol). The pistol used the Walther double-action trigger mechanism that was also used on the later P 38, and other features included a lightweight receiver and, next to the hammer, a signal button that protruded when the weapon was loaded. In overall terms the design was light and slim. From 1939 the Model PP was manufactured for military service in 7.65mm and 9mm calibres, the main operators being the German Air Force (Luftwaffe) and the German Army’s tank (panzer) arm, both of which needed a small weapon. Introduced in 1931, the Model PPK was a smaller version of the Model PP and was initially manufactured for easy carriage by plain clothes policemen as indicated by the full designation, Polizei Pistole Kriminal (police pistol, detective). Except for its smaller size, the Model PPK was similar to the Model PP and was delivered for service use (especially by the German Air Force) from 1939. The Model PPK was chambered for the same calibre as the Model PP, the magazine holding seven 7.65mm or six 9mm rounds. Like most German small arms, the PP was manufactured to a high standard.